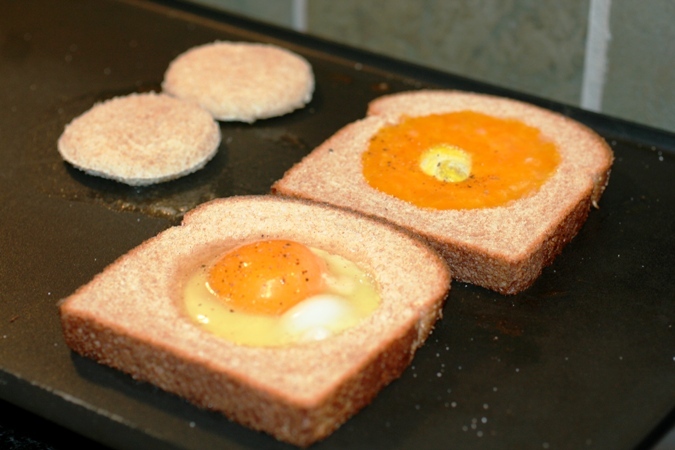 Eggs in a hole have become the kids absolute favorite thing for breakfast. They run a close second to our ever popular oatmeal that they have EVERY MORNING! I was really glad to find something new for them, plus it is a fun and very easy treat for breakfast. Their favorite part are the “holes” on the side that I toast with butter. We bought an electric griddle during Black Friday last year, and I use it almost every day. Using the large griddle surface allows me to make everyone’s eggs at one time. My daughter and I love our eggs over-easy, but my husband and son will have nothing to do with what they term as “runny” eggs. They like theirs good and scrambled. So, before putting the eggs into the “hole,” I give them a quick whisk in a small bowl before pouring them in. Everyone is happy. Not a bad way to start the day! Heat a griddle to 350 degrees or medium heat. While heating, take a glass and cut out the center of the bread in the shape of a circle. Take the butter slice and spread it on the griddle. Lay both pieces of bread over butter. 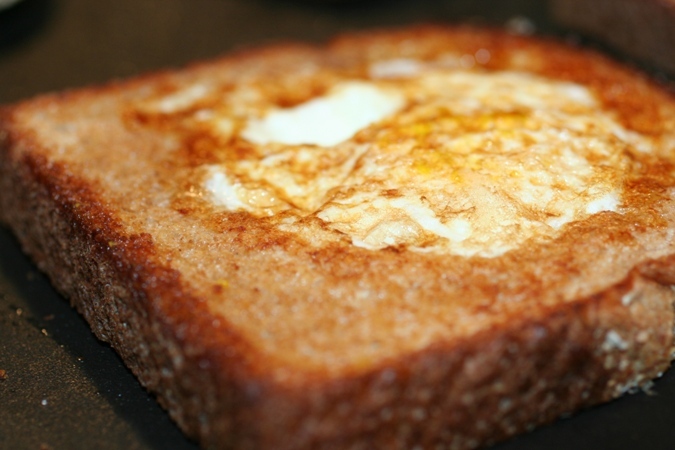 Crack an egg and pour into the "hole" in the first piece of bread. Turn the "hole" piece of bread and brown on both sides. Turn the large piece with the egg inside over to your liking. I flip once the bottom has turned white and the yellow starts to set. Serve with fruit and the circle piece of buttered bread. Find more Breakfast and Brunch Recipes on Faithful Provisions! We also call them Toad in a Hole, I save the little circles of bread for PB sandwiches for my 3 year old he loves them, they are the perfect size for him. Such an easy breakfast and a good one for on the go. We also use a griddle, it makes life easier with 3 sons and baby #4 on the way I only see having to use the big surface more. We saw these on “The Pioneer Woman” and my son fell in love with them. I had to make them this morning for him. We used to make these as kids but called them “birds nests”. Thanks for posting this! I had completely forgotten about them. Made them this morning and my 2 year old loved it! !